The largest-selling resilient flooring product in terms of square footage is vinyl composition tile, or VCT. It’s inexpensive to buy and easy to install, but, like any other flooring product, there are ways to do it well and ways to cut corners so the installation will not be as good as it could be. There are also other types of tile with “composition” in the name, plus “premium VCT,” “enhanced VCT,” “luxury vinyl” or just plain “vinyl” tile products out now that install the same way as standard VCT. With these newer products, make sure you follow the instructions because the adhesives are usually different, as are trowel size, open time and whether or not you have to roll the floor. For the purposes of this column, we will be discussing basic, traditional VCT on large commercial jobs. I see a lot of floors and am amazed how sometimes I see a VCT job that looks great – with nice tight seams and a smooth surface, and other times I see floors with gaps, cracks and bumps and I know that the installer was probably under the gun and had to get the job done quickly without proper preparation or testing. Here are some hints for a successful VCT installation. For starters, job site conditions and substrate preparation are important. It’s no different than any other resilient floor. VCT is pretty forgiving, but I still do not recommend doing jobs when you don’t have climate control, or worse, on a site without doors and windows. The product can be adversely affected by temperature, although it is often assumed it doesn’t matter. For example, if you install VCT in the summer with no air conditioning, it’s not unusual for the tile to “grow” a little because of the heat. If you install it in that condition, when the tile cools down later on, some gaps may develop as the tile returns to its original size. The same holds true for concrete moisture problems. It is often assumed that VCT is more moisture tolerant than other flooring materials, but moisture related failures can and do happen on VCT just like any other flooring material. So, do your moisture testing to be sure. And, of course, make sure the substrate is very smooth before you start laying the floor. 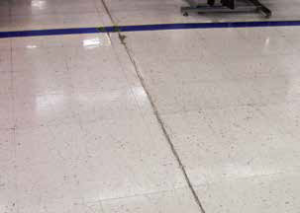 Any dips or low spots in the floor can be a cause of bubbling or cracking after installation, as can installing over expansion joints or trench cuts in the floor where the concrete is not yet dry. Remember, VCT cracks easily, and these floors get coated with a floor finish after installation, usually a high gloss finish. That means every little bump is going to telegraph through. Don’t cut corners on floor prep. Depending on the job, you have several choices in adhesive for VCT with regard to open time and working time. Some VCT adhesives, such as acrylics and epoxies, have short open times and working times, and are a “wet lay” installation. Other “thin spread” adhesives have open times of 30 – 60 minutes and working times of six to 24 hours. On long open time adhesives, I prefer not to leave adhesive over night because it will attract dust, dirt, and worse when nobody is there to keep an eye on it. Only spread as much as you can cover before you go home, regardless of what the label says. VCT “run off;” there are ways to prevent and correct this condition if you take a little extra time. Spray adhesives are another option that is getting more popular because it keeps you off your knees, allows traffic almost immediately after installation and has higher tolerance to moisture. Make sure you sweep or vacuum really well if you use a spray. Match the adhesive you are using to the type of installation you are on and pay attention to trowel notch size as well; some adhesives are designed to go down with a fine notch and others a larger notch. More is not always better! Too much adhesive can cause bleed-through, tile shifting, cracking, or indentations. Another point that gets missed is rolling the floor. Some adhesives require it and some do not. Don’t forget to roll the floor if the instructions call for it because failure to do so can mean a very weak bond to the substrate. Once you get into laying the tile, “run off” is a big problem for a lot of installers. In large areas, if the tile runs off ever so slightly, by the time you get 20 or 30 rows down, you don’t have four corners meeting any more and you wind up with “windows” at the corners. Of course with “ashlar” (also called brick or staggered) installation, this is not an issue, but most tile floors are installed point-to-point, so runoff is an issue. 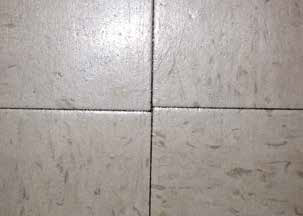 First, tile run off is rarely caused by the tile itself being out of square. I’ve had a lot of tile tested and it almost never happens. Make sure while installing to follow your accurately placed layout lines. It is more important to be sure the lines are followed rather than letting the tile guide you while installing. Not following the lines can be a cause of runoff. A second cause of runoff is undulation in the surface of the subfloor, so during preparation, be aware of waves or slopes and use a patching compound to smooth things out. This photo shows the risk of installing directly over an expansion space, resulting in cracking tile. Another cause of runoff is the way the installer sets the tile. Don’t hold the tile by the corner as you set it into the adhesive. A right-handed installer, for example, will pull the right side in slightly tighter than the left. This can cause one side of the tile to be slightly tighter than the other. This can be avoided by holding the tile in the center, not by a corner. What about “correcting” the tile if it starts to run off? Making an occasional cut-back can help. This means stopping and cutting the tile a small amount to create a straight line again. Another way is a sweat-in, meaning skipping a row, start a new straight row, and then heat up tiles to fit into the slightly smaller space that is left. Some of these practices add time to the job, but like all of the other details we have mentioned here, a little extra time spent can make the difference and give the owner a good-looking finished product that is flat and tight. Christopher Capobianco is a flooring expert currently working in the metropolitan New York market for Ecore Commercial Flooring. Chris’s family lineage in floorcovering goes back for generations. 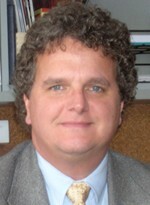 His career includes time as a retailer, architectural sales rep, technical support manager, consultant, instructor, columnist and active volunteer in several organizations. I’d recommend picking up some of the affected tiles to see what’s going on beneath. This could be telegraphing of irregularities in the concrete subfloor. Indentations could be in the tile itself because of heavy weight or furniture, or could be telegraphing of dips in the substrate that were not addressed prior to the original installation. Bubbles could be caused by bumps in the concrete, debris left behind, and so on. At the same time that you remove tiles, run some moisture tests throughout the floor to see what the condition of the concrete is. The recommendation is three tests for the first 1000 square feet and then one per thousand. I’d do the ASTM F 2170 relative humidity test throughout the space, which is easy to do by picking up a single tile and drilling a hole in the slab, placing a probe and coming back the next day for a reading. This is easier than calcium chloride testing that requires you to pick up four tiles, grind the slab clean, wait a day , place the test and then wait three days. If there is a moisture problem, that will need to be addressed, and you certainly won’t be able to go over the existing floor. 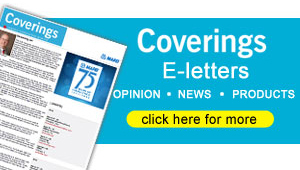 Hello Christopher, I found your article very informative and insightful in researching industry standards for permeability requirements of VCT floor finishes. Specifically, a 100% solids UV curable acrylic coating, which is considered to be semi-permanent top coat. If I could ask two questions to you based upon your vast background…do you have any experience with field-applied UV curable coatings for VCT? And if so, have you seen any issues or flooring failures in general with this type of finish? Currently, I’m researching potential moisture issues below the VCT related water vapor transmission or permeance of such a highly cross linked coating. Any insight or advice you could share would be most helpful and greatly appreciated. Thank you! I’ve heard anecdotally about these products being used on a variety of resilient flooring products with good results from the point of view of reducing life cycle costs of maintenance. I’ve worked on a few projects myself, but not with VCT specifically. The failures I’ve experienced and heard about have been related to improper application – coating going on too thick, etc. . As far as a specific connection to slab moisture issues, I know of no correlation. The concept that VCT somehow “breathes” and allows moisture to pass through the tile is a stretch. Many VCT related failures have occurred because an assumption is made that VCT is more tolerant of moisture than other floor coverings. I would never make such an assumption. I had an armstrong VCT floor installed in my kitchen this summer as part of the renovation of our old house and about 1/4 to 1/3 of the tiles are now cracked. Some of the cracks are long and follow a line across the floor and my guess is that they follow a seem in the plywood beneath them and some are circular as though they are over a screw or nail that is slightly popped. My installer said it did not need a leveler since there was new plywood underneath and I believe he just used the adhesive. Any ideas about what’s going on? Any way to fix it without replacing the whole floor? and if I do need to replace the whole floor, should I use a differnt type of flooring?